OK so now we know why those silly little Smart cars exist. They're really not good for much and look like they'll blow over in the wind but cupcake maker Little Debbie has a use for them. The brand is launching a new cupcake and, along with a Facebook page, a 125,000 carton cupcake giveaway, a mobile tour, a Twitter feed, a YouTube channel, a Flickr photostream, event marketing, TV spots and blogger bribes..,uh...blogger outreach, will giveaway two Smart cars. From October 11 through December 12, a truck filled with branded Smart cars will stop in Washington, DC, Philadelphia, New York City, Boston, Manchester, NH, Hartford, CT, Scranton, PA, Pittsburgh, Cincinnati, Detroit, Chicago, St. Louis, Atlanta, Miami, Tampa, Orlando, Houston, Dallas, San Antonio, Phoenix and Los Angeles. "Our goal was to create a bigger-than-life campaign that could be leveraged across every medium imaginable," says Luckie & Co. Executive Vice President/Creative Director Brad White. 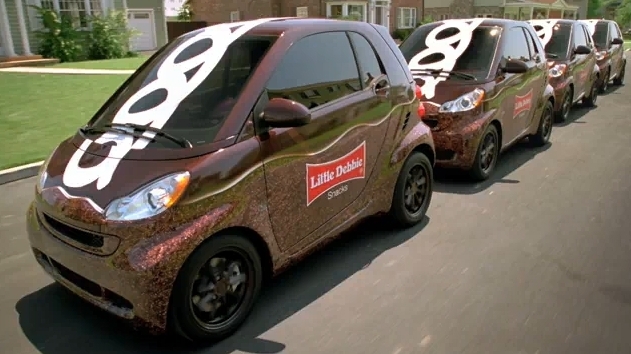 "Who could resist a Smart Car wrapped like a Little Debbie Cupcake? Come to think of it, who could resist a Little Debbie Cupcake?" "We have high expectations for new Little Debbie Chocolate Cupcakes and are tremendously excited about this new campaign," says McKee Foods Executive V.P. Sales & Marketing Chris McKee. "Luckie has helped develop a communications strategy grounded in strong understanding of our core consumer and has executed that strategy in a campaign that will help drive awareness of this new product and encourage consumers to try it, while building the overall equity of the Little Debbie Brand."